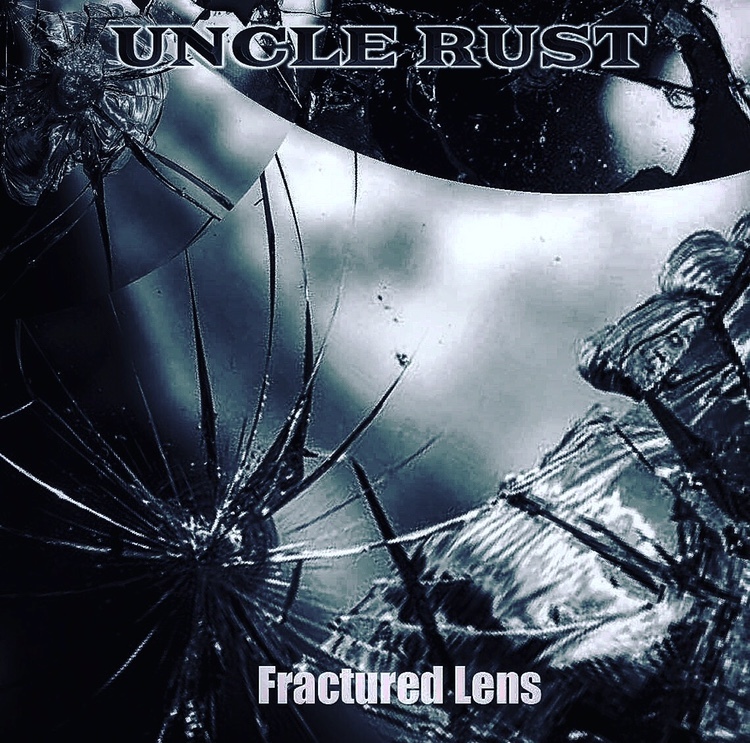 ‘Fractured Lense’ is the 3rd Uncle Rust album, independently produced, with mastering by the renowned Pete Maher. Rarely, it’s a double album of 21 tracks. (Or 23, if you count the mysterious 2 bonus tracks unlisted at the end of the 2nd disc). Uncle Rust are a hard rock band, presently playing live as a 3 piece. Their music’s centred around groove and riffs. As the songwriter, guitarist and vocalist, Justin McConville’s inspirations include 70’s and 80’s hard rock and metal, early prog, for instance Yes, Return To Forever, Pink Floyd and Frank Zappa. As is now becoming commonplace, the lyrics originate from personal experience of life and all that goes with it. This of course, includes the usual socio-political, religious and intimate overtones. It’s hoped that the outcome, within the songs is balanced equally between positive and negative consequences. Uncle Rust released their debut, ‘Six Years In The Desert’ in 2014 and then ‘Anti-Collision’ followed in 2016. 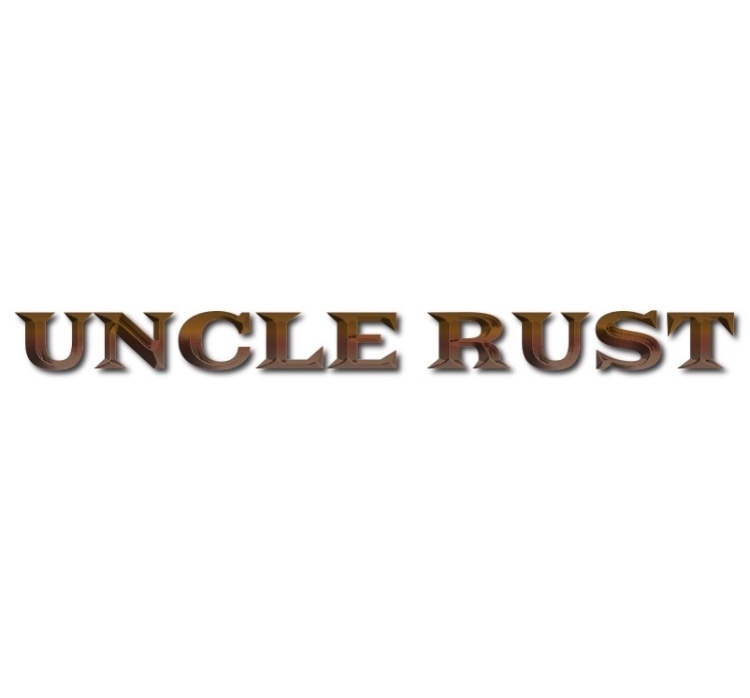 Uncle Rust’s music is available on all digital platforms. Their first live show of 2019 will take place at the Monarch, Camden, on Sunday 24th March. Uncle Rust are Justin McConville, (guitar and vocals), PJ Phillips (bass) and Chris McConville, (drums). My Blackened Heart – Instant laid-back riffage intro’s, equally laid-back vocals. Slightly bluesy, the 70’s influence is clear. It’s a tad Clapton-esque, in places and that relaxed pace suits the band well. The Lesson – Slight sinister key opening. Quite a tricky tone to get right and it’s well handled. There’s an ease about this performance, reflective of long experience. The edge is definitely there, but it’s almost veering towards an easy listening stance. Ending on a cymbal hit. Count The Heads – Opening with a similar sound again, this time, mirroring a section of Ozzy’s ‘No More Tears’. Heightening the pitch, at times, short, but sweet. Billionaire – Changing over now, to a marginally tighter sound, with plenty of tasty classic undertones still showing through. The riffs are in good hands and it’s easy to see why the tracks are so riff centred. There’s never any mistaking the kind of passion and accomplishment audible here. A brief one again. The Silent Hand – Another slight tendency towards darkness, becoming more prominent here. Quite doomy and sombre, in mood. More lyrically visual, keeping that same haunted note going throughout. The riffs get sharper and more experimental approximately 3/4 in, delving into a couple of para-diddles and again, it’s a short ending. Dancing – Higher vocal pitch intro’s here, leaning more towards acuity of tone. Imagine a rockier Sting. Some nice yummy twiddly sharp riffs, but it ends abruptly. On The Run – A minor eeriness opens, depicting the title well. Now, the riffs have their day, throwing in some colourful blues licks, lining up well with the drums. Straddling several genre conventions, this is a sound that could fit many categories. Another short track. The Last Day – Darkening the landscape again, with those creepy riff tones. Good performance, very visually evocative and showing hope and despair, light and dark, in equal measure. Skilled vocals, easy to feel. It’s very accessible music, with an unpredictable thread. There’s a warmth within it, cementing its catch. Futurage – Introing with an easy blues sound. A relaxed feel and atmosphere permeates it, despite its lyrical darkness, in places. Lots of melody, colouring those riffs. Ending on a good solid drum roll. Travelling Alone – A lesser note of dread enters this, at times, yet much of it’s actually quite vibrant. Very narrative, in style and as with the rest, closing quickly. Full of great material, the first half of this double album shares the same aspect equally amongst the tracks, of being over when they’ve barely begun, but it’s always a good thing to be left craving more. Searching In The Dark – Introing on a fabulous classic riff, echoing Steppenwolf’s ‘Born To Be Wild’ and The Stones’ ‘Jumping Jack Flash’, simultaneously, but maybe that’s just my strange mind at work. It does have a very classic 70’s vibe, throughout, though. Like the late Bon Scott, combining those AC/DC-esque vocals with lighter rock instrumentals, it’s a good starter, leaving an impression. All My Sins – Increasing the pace now, reintroducing that narrative thread again. Fairly traditional rock ‘n’ roll stuff here. A faster paced one, with plenty of catch. Lord Of Crime – A cooler, more modern vibe opens, telling another story in a similarly visual way to the rest. This one’s bluesy, with a harder edge – ideal driving music. Great rhythms within those riffs, fading out on a memorable one. Share Your Troubles – A more fun loving sound here, it’s a singalong track, with magic scattered through the riffs. Even including a ‘Flight Of The Bumblebee’ echo. Workably old school, especially in its riff arrangements. The Cloud On The Horizon – Somehow, there’s a background sense of Sabbath-esque mood in here. Also mirroring sections of the ‘Still Crazy’ soundtrack, here and there. Still bluesy enough to reflect distant strains of Whitesnake’s early material, it just works. Start The Party – A suitably light-hearted strand characterises this. Keeping it that way, assisted by the quick pace, it’s just an easy listen, demonstrating some decent riff scales and general well capable handling. Drum hit closing. The Catcher Of Your Dreams – Intriguing theme and tones, once more, it’s clearly audible where the influences have come from and the outcome’s a great sound, combining traditional and modern methods, making it equally accessible to all. A notable hook solidifies its catch. Forever – Dark atmosphere, from the start. Fairly refreshing in its retention of that serious, perhaps more meaningful thread. Just as catchy, in the choruses. Murdering Icons – Opening on a more complex riff, almost visually diagonal. Now the tone’s become creepier, to match the title. A brief, but profound reference to John Lennon and his world prophecies coming to light in today’s society. Intelligent use of riff tones. The Junkyard Of Broken Hearts – The contemplative tone continues. Clever chasing riff pace adds another dimension. These guys do socially relevant meaning well. More fun riffs and plentiful demo of ability to associate depth between vocals and accompaniments. World Of Hate – Sliding into life, instantaneously, something mesmeric infiltrates this, showing through the use of repetitive sameness, which somehow, seems to work. A mysterious bonus track, quite pop rock in form. Again, reflecting the best of old school and new wave. Mixing it up well. Final mystery track – Echoic intro, remaining for the rest of the track. A bit of a wildcard, as if plucked from mid air, at the last minute, the sound seems to move away into the realms of obscurity. Ending definitively, though, on a brief drum finale. Overall – A very listenable album, with enough going for it to make it worthwhile. The riffs, as emphasised, are its central driving force and as such, they do a good job. Vocally, it’s intriguing, seeming to swing between old school hard rock and metal influences, to more pop based realms, with a scattering of prog, but that’s as stated in its background info aswell. There’s plenty of skill base within it, though, especially vocally and riffage wise. Fairly visual, ‘FL’ is a decent easy listen, working the blues angle especially well. One for a laid-back mood, or a drive on an open road. Just wish the tracks were a bit longer. For fans of Clapton, Cream, Paul Weller, Iggy Pop and the Stooges, The Stones, Sting, Bon Scott era AC/DC vocals. Female fronted metal from St Petersburg, Russia, Fallcie formed in June 2017. Previously known as NU-NATION. The 4 piece brought out an EP, entitled ‘The Outer Space’, in 2018 and have now released their EP, ‘Born Again’. Under their previous moniker, NN, they played on extensive tours – mainly through Europe, once in Russia, alongside SoulFly, Ektomorf, Betraying The Martyrs, amongst others. 3 albums were launched as NN. Following the name change to Fallcie, in June 2017, a new single, ‘Rock ‘n’ Rolla’ was released in music video format. From autumn onwards, the tours began, well received by fans of both NN and Fallcie. 2018 saw a change of vocalist, with whom, ‘The Outer Space’ 4 track EP came to light and the European tour continued. Summer of that year brought a new full-time vocalist. Then came the full-length album and gig preps for the rest of the year. On October 7th, Fallcie’s debut album, ‘Born Again’ was launched, followed by a near 2-month tour, throughout Europe and Russia. The Pulse Of Fallcie – Instant blitz of metal riffs intro’s. Extreme and simultaneously melodic vocals, similar to those of Nicki Mckibbin, of Love Stricken Demise. Just a very passionate, fast-paced, catchy track. Good starter. Nebula – Opening with breathier vocals, moving straight back into that gloriously rocky sound. Imagine 4 Non-Blondes, singing more extreme stuff, with slightly stronger edge. The wild enthusiasm really comes across well here. Some great hard tipped bluesy, metallic riffage interplays perfectly with those impassioned vocals. Ending on a well-placed riff fade out, it’s seriously impressive. The Longest Road – Lovely bit of cool riffage intro’s, joined by easier, looser vocals, relaxing into it, before firing it back up again. Easy to get into and follow, these are made for metal vocals, for sure. A real catchy vibe about the melodies and heightened pitches. Just ends a little too abruptly, but otherwise, brilliant. Emptiness – Great heavy drum hits and riffs intro, throwing themselves straight into it. Vivid and livid, all at once. So colourful. Razor edged hardness suffuses this with energy. Impressive momentum keeps up an active, frenetic pace, incorporating a bit of in and out effect, making the most of every opportunity for action, right up to the line. Rock ‘n’ Rolla – Immersive from the off, chucking in some tasty fret bending, those hugely talented vocals really come alive, showing all they’ve got. Slight trance effects bridge the rest with the outro. Well utilised sections throughout. Where The Journey Ends – Instantaneous catchy fast riffing intro’s, with equally paced drumming. Those vocals are just incredible. Screamy and musical, at once. So consistent and always so enjoyable. Massive catch, with chasing pace. Just divine. Voice Of Decay – Slightly sinister tone opens, telling a story all of its own. Brilliant high-speed drumming and always, the vocals keep up, never missing a beat. Power screams from them. Demonstrating both musicality and talent for sheer extremity. Some gorgeous involved riffing in there, keeping you hooked and collaborating nicely with the closing drum hits. Such a memorable sound. Espers – Beautifully drastic intro there! Fulsome and engaging, immediately. Loving that show of riff scales, with a hardened, echoic edge. An equally beautiful floaty vocal section, impossible not to get sucked into. Just entrancing, from start to finish. Wake Up – Ace quickened drum roll opens. Great stonerish riff leading off from it. Going from grungy to speed metal in a moment, becoming a highly affecting experience, moving fluidly, from one catchy, capable section to another. Loving that gritty sharpened vocal edge. Just reels you in and doesn’t let go. You Are Nothing – Very modern feel to that intro, very slightly RATM-esque. Going straight back into another thrilling metal ride, keeping all your senses fully engaged, the whole time. Such strength in those vocals, taking their capacity to the absolute apex, with heightened precision and power aplenty. The Black – Opening on another chase pace, moving right into a refreshingly acute vocal. The drumming maintains a fabulously fast rhythm. Everything just fits together, in complete synchronisation. Faultless, massively catchy, filled with major hooks and a fun, exciting and thrilling listen. Great to hear that very fine balance between extremity and ingrained melody so deftly displayed. Overall – Sharp, zesty and filled with dazzling metallic life and vivacious energy, ‘Born Again’ is a star find and a captivating listen. Demonstrating expertly that rare realisation, that extremity and melody can and do go together, it reflects that, right up to the end. Staying catchy, yet acute, throughout, ‘BA’ makes a strong and powerful impression. Vocal gold and seriously unforgettable. For fans of Love Stricken Demise, 4 Non-Blondes, SIVA ADDICTION. PROCESSOR began life in 2014, under another name. Commencing practice and performance immediately, they initially sealed their reputation locally to them, in Munich, Bavaria and surrounding areas, starting small and as support for established bands, such as Entrails. Constructing an approach combining the best of death and thrash, that sound has remained. 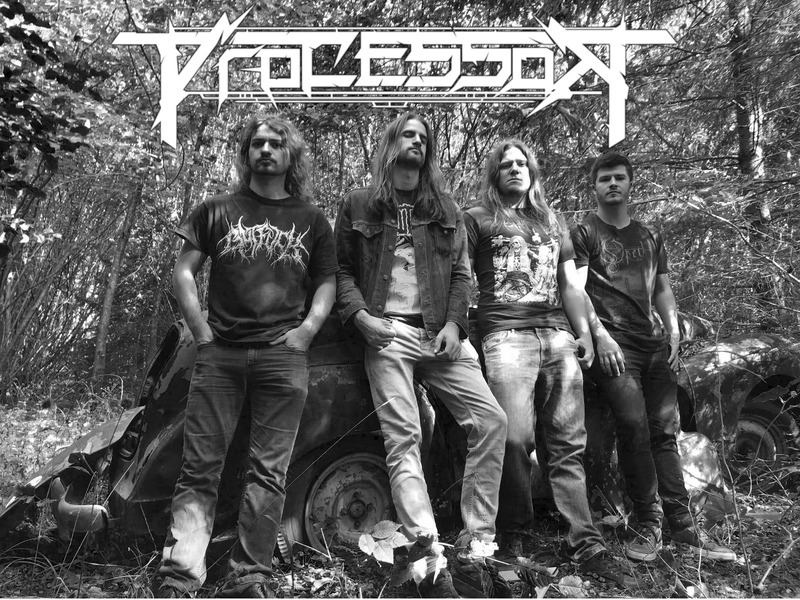 Later, changing vocalist, the PROCESSOR name was established and they then produced an EP split, with death metal band EGOIST, during early 2018. ‘HELIOPOLIS’ is their debut album, recorded at WALZWERK studios, mixed and mastered at IGUANA studios. They’ve been promoting it live, ever since. RIP TV – Instant thrash hit intro. This has got it all from the start. The rhythm’s there, along with the classic thrash riffing, drumming and the throat destroying vocals, added to the thrash melody. It makes a great impression. Vaporized Space – Great effortless drumming intro. Gets straight into it, offering up what starts out as a looser rhythm, growing tighter, as the track continues. Decent anthemic vocal sections, burning thrashy riffs and vocal cord shredding. All the time, the pace is truly thrash. Faultless, really. Especially since the melody’s always there and very much present. This band’s in accomplished hands and it shows. Fodder For The Grinder – Easily conveyed cymbal hits intro, followed by heavy riffing, thrash rhythms and death vocals intermingle with melodic thrash ones. Always a successful combo. Speed heating up, throwing in a trad classic thrash sound, handling the few experimental pace alternations expertly. At that point, the riffs get ultra melodic, a spin which’ll always do the trick for this reviewer. Good solid bass line, providing a strong driving foundation. Impressive. Phyresis – Drums opening, with immediacy and thrash thrills. Again, that reassuringly old school rhythm hits. Some great tight fretwork shows itself and everything has its moment in here. A few more group vocals return, momentarily. Death style roars more prominent here, though. 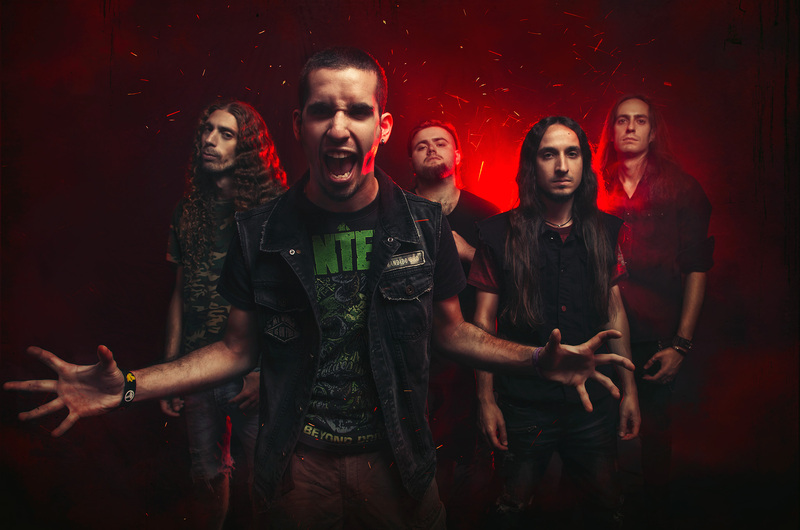 Bringing extremity to the table and mixing it up with melody, standard heavy-metal stuff and thrash/death medley styles, this is one skilled band. Even introing some classic rock melody, towards the end, they’re certainly inventive, that’s for sure. Heliopolis – Solid riff and bass line intro. Drums settling in comfortably and working to fit around them, with absolute intuitive ease. Vocals becoming screamier and growlier now. Great strong rhythms and drum rolls in there. This one just races along, picking up every note with total professionalism. Ending abruptly, but competently and definitively. Pest Generator – Nice heavy thunderous drumming intro’s, depicting an approaching storm. Very screamy vocals again, but still some group backing anthems, in places. Lots of roary growls in here. Frenetic pace, weaving in and out of melodic, eastern edged riffs. Moving intelligently, towards a profound, slower paced ending, just making that final fret slide audibly enjoyable. Sentenced To A Lifetime – Echoic intro, through steel strings, performing an eerie, sinister melody, with an air of omen. Building that into a faster, aggressive section, then slowing it down and mellowing it out, to a mid-paced speed. A notable classic background to this, whilst alternating constantly, between that and a fresh, modern thrash sound. Curious lyrics! It’s just such evident ease of delivery, throughout. Clever use of creeping bass and riffs at the end and a vocal finale, much like that at the close of Pantera’s ‘The Badge’. Phosphor – Tasty heavy riff and drum roll opens, along with a shout of ‘WAR’, instantly echoing Exodus’s ‘War Is My Shepherd’. Also reminiscent of Slayer’s ‘War Ensemble’. Intriguingly segueing, from there, into an almost folky vocal section, before squeezing more screams out, for all they’re worth. A gorgeous riff melody comes next, portraying a very classic metal stance, which my fellow Metallica fans’ll enjoy. Dredging up the most extreme, blackened vocals, from the depths of below. Gradually slowing the pace down, till the end, in expert fashion and closing on the sound of a burning fire, this is what you call going out with a bang – although, ironically, it’s more of a smoulder, but the point’s made. 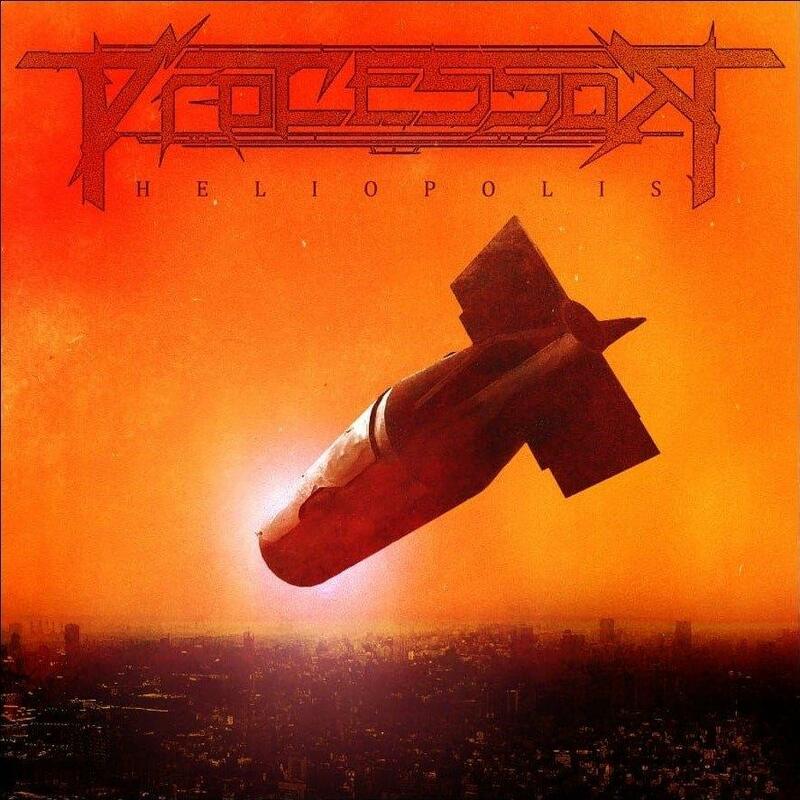 Overall – Beyond impressive, ‘HELIOPOLIS’ is a flawlessly crafted album, comprising every aspect of thrash imaginable. Each track’s a storehouse of intrigue and variety, deftly delivered, guaranteeing quality listening and zero boredom rating. Whether your preference is old school or modern thrash, this’ll work, as it’s got it all. Spectacular. For fans of Exodus, Carcass, Pantera, Testament, Slayer, Bullriff Stampede, Taint, Zeit. 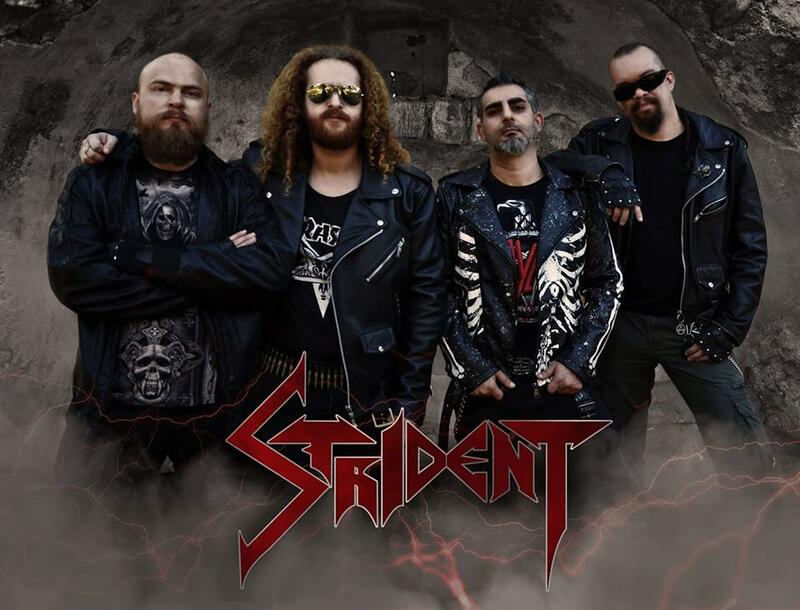 Thrash metal from Israel, formed in 2004, Strident spent 4 years creating original music, altered the line-up and then independently launched a limited edition demo CD, entitled ‘Insanity’. 2010 saw the launch of a debut album, named ‘On The Aim’. A crucial fixture in Israeli thrash metal history, ‘OTA’ was the 1st full-length thrash album in the scene, back then. Extensively reviewed internationally, both digitally and in print. Key shows include opening for Overkill, in Tel Aviv, in 2015, 2016 appearances overseas, in Ukraine, at Annual Metal Fest and opening for Nervosa. Following ‘On The Aim’, a new single was released, entitled ‘Final Warhead Blast’ and in 2018, this current album, ‘March Of Plague’. No Faith No War – Instant thrash drum roll intro’s, brooking no argument. Classic sounding thrash riffs and rhythm combine with gore style vocals. This has got a real new wave slant to it, closing with everything in complete harmony and a well-placed cymbal hit. Fresh and driven. March Of Plague – Opening on a fairly G’N’R’ style riff, with a traditionally Israeli melody, before blasting into a heavily metallic section. Death/thrash vocals and some great Slayer-esque riffs in there. Blackened sounds accompany the final anthemic, united effort, for the closing line, ‘March Of Plague’, as in the title. Very well crafted, politicised song, with a good point to make. Be Metal – Thrashy from the start, this one gets right into its stride immediately. Even more blackened sounding vocals dredge up the motto behind the track title, spewing it out, in a near approaching repetitive chant. Drumming to kill, with relentless energy drives on, till the end. Just pure thrash. Dirty Blood – Very tasty riffing intro’s, gently, yet meaningfully. Slower pace, lower tone, performed with flawless technique. Livid lyrics vomit incensed range, through to the rapid close. Brief, but full on aggression. Final Warhead Blast – Tighter slide riffs open, assisting the drums to hammer the message home. Faster raging pace, some definitive, intense, assertive drums and a decent bit of whammy and vibrato. It’s just very capable and performed with complete ease. Unarguably tight performance. Nuclear Winter – Bomb blast intro. Always reliably effective. More deathy vocals scream out the lyrics, in this short, but angry blast of rage. Spit Fire – Sinister riff intro, with a very traditional melody to it. The monster returns, to roar its’ guts up, but an anthemic backing chorus accompanies it now. That anthemic strand works well for this band, adding a certain edge. There’s a good groove to the rhythm in here, giving the track that extra hit and it ends on the same indefinable drive. Face To Face – Energetic drum roll opens, setting the scene for more of that same energy. This is just relentless, unrepentant speed and menace. A full on attack of thrash intent, with all the irrepressible rage and stamina to prove it. Fallen One – Wow, that steel string intro just hits you instantly. Segueing, with fluid motion, into electric power, the thrash/death vocals follow. Mid-paced rhythm here, it just sort of rocks and rolls along, on a thread of ease. Great riffs always add the melody and keep it metal. Fun rhythm keeps it going, fading out on another eerie riff, bringing it full circle. Thrash Till Death – Opening gradually, on a riff much like that on Alice Cooper’s ‘Poison’. Truly thrash, from the start, it just races along, in that classically party metal way. Proper riff heavy moshing material here, making you long for the pit. You could call this one a metal motto and one that stands up to it well. Another one taking you back to thrash metal riffs you can’t place, so have to find and play, till they’re out of your head. That’s the power of Strident. Overall – Consistent, effortless and truly thrashy, ‘MOP’ is probably one for the collections of all die hard thrash enthusiasts. Keeps up the rhythmic momentum, throughout, demonstrates effective handling of riffs and powerful drums, a little bit more lyrical melody may have added more, but there’s definitely strength in those vocals and collectively, it fits together well. Would play well alongside most other thrash bands, as decent metallic filler. The jewel in its crown is its anthemic vocal sections, combined with the thrash riffs. They give it the lift and the signature. For fans of Testament, Slayer, Carcass, Skreamer, Hammerstroke, Taint, Demonik. 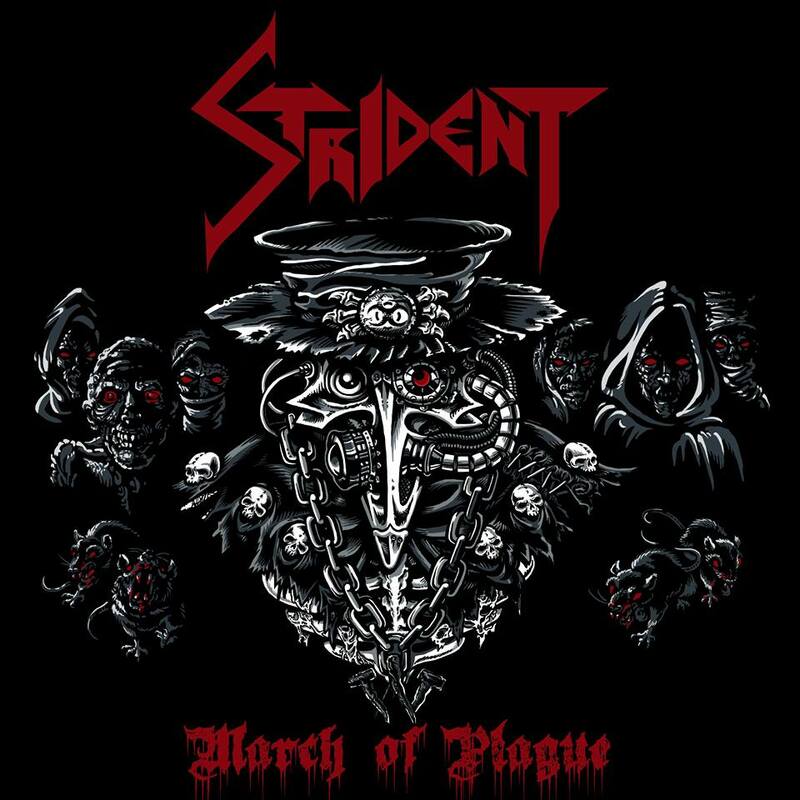 https://www.youtube.com/watch?v=kRaTaPfQi8U (‘March Of Plague’ – 2018). https://www.youtube.com/watch?v=QVKsHgdcT2M (‘Final Warhead Blast’ – 2016). https://www.youtube.com/watch?v=aqT6g-1Xkqs&t=47s (‘On The Aim’ – 2010). 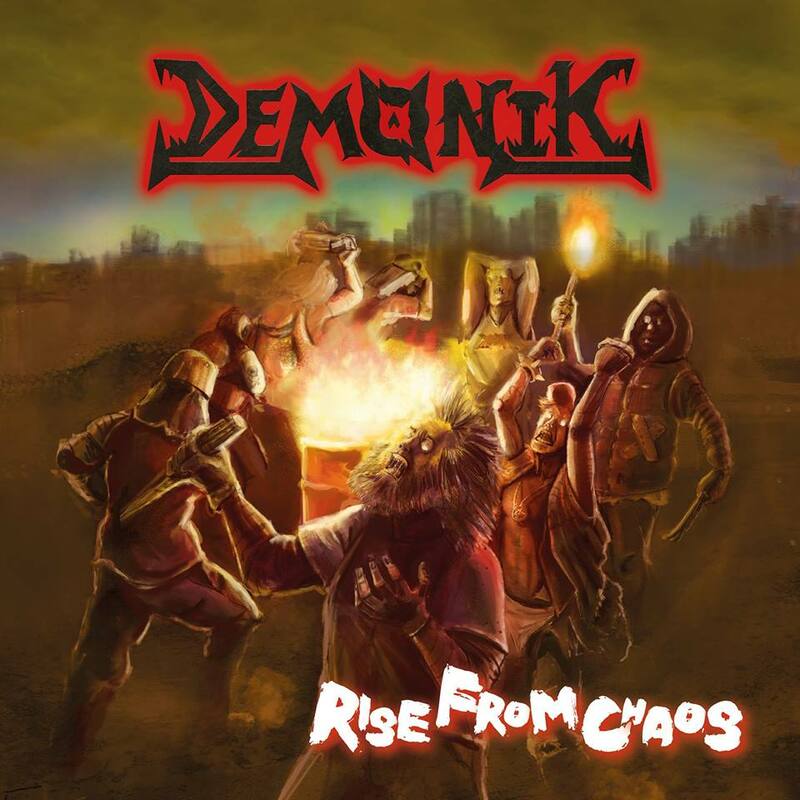 Formed in 2007, in Madrid, Demonik now present their 3rd studio album, ‘Rise From Chaos’. Featuring Dani Perez, on drums, probably the most famed drummer in Spain, that’s just one of the things that make ‘RFC’ stand out from the rest. A richer album than their previous ones, ‘RFC’ has embraced the need to move with the times, whilst retaining their own signature. Recorded and mixed in Sadman Studios, Madrid, by Carlos Santos, from 2016-2017, mastered by Jens Bogren, at Fascination Street Studios, Orebro, Suecia. Perfecting and honing their art for 3 years, Demonik first played live in 2010. That same year, their debut studio album, ‘Demon’ was released and some regional shows and a short national tour came next. Several months on, a new line-up was built and their next studio album, ‘Las cenizas de la Tierra’ followed, in 2013. The contribution of Mika Jussila, in mastering the album was a significant leap forward for Demonik, in the outcome for their sound and became known throughout the Spanish underground. The track ‘Tormenta’ and its lyric video attained high acclaim, as did their demo band video, ‘Culto a la guerra’, which prompted their 1st ever national tour, with 19 dates. Off the back of this success came their 1st live album, ‘Directo al Infierno’, in 2014. More line-up changes followed, continuing till 2017. October 2018 saw the successful release of ‘Rise From Chaos’, after its preceding professionally produced video, ‘Insomnia’ went viral – in fact, it was the highest viewed premiere in Demonik’s history, to huge positive press. Bringing things up to date, this year (2019), they will open for Vomitory, in Burgos, during their reunion tour and also for Soziedad Alkoholika, in Donosti. José A Rodriguez re-joins, as drummer, for this tour. Demonik are now quickly filling tour dates, promoting ‘RFC’ and aim for Europe next. Burning My Soul – Very aptly fiery explosion of an intro. Brief death style vocals, before the thrash angle takes over and pointed thrash vocals interweave with the gory ones. It’s almost a darker, deathier version of Alice Cooper’s early material. Harsh, edgy and fairly unusual in its thrash/death format and performance style. Rise – Very growly intro, demonstrating some fittingly demonic riff scales. Soon segueing back into thrash territory, bringing fire to their performance. Some nicely melodic riffage in there and suitably jagged vocals. Yummy twiddly paradiddles, climbing up and down the scales, with huge visual acumen. No doubt about it. It’s heavy stuff. Catchy chorus, you’ll find yourself humming along with quickly. Ending on another gory growl. Powerful and lively. Insomnia – Intriguingly anticipatory intro. It soon bursts into flames, rapidly forming an effective interplay with gentler sections. Some great experimentation with pace and rhythm. Liking the strength and volume of that riffage. It really shines out in this track. There’s real quality in here and the level of accomplishment stands out starkly. Ending on more smoky riffing, a definite candidate for the standout track. Chaos – Beautiful, Testament-esque riff and drum intro. Setting the scene immediately, for more darkness and dread. Furious pace drives it forward, with rapid-fire riffing and drum rolls set to impress. Pure ‘Days Of Darkness’ territory here). It works. Razor edged vocals and just an absolute blitzkrieg of awesome power. Actually, that could easily top the last track in the standout track stakes. Possibly we have two standouts). Voices From Hell – Very visually hell like, or at least a clear aural representation of how you’d imagine it to be. Unexpectedly introing some rather lovely acoustic riffage and softer melodic vocals. Still, the undertone of dread remains. These guys are evidently skilled at creating audio-visual depictions of their chosen themes. Building it up into an epic saga, the pace quickens, racing to convey the urgent themes. Lots of darkness and an equal amount of colour. A perfect metal musical track. Stunning pace, becoming increasingly frenetic as it continues. This is one of those albums which just gets better and better, the more you hear. Slamming drum rolls towards the end, gathering pace, till the next massively melodic and again, very Testament-esque, epic section. A whole story-line seems to unfold, within this track. A very long and drawn-out, but thoroughly enjoyable and rewarding track, employing some very skilled, operatic female vocals, injecting even more melody and colour. So vibrant. Once more, it speeds up, throwing in some Dalek-esque vocals, briefly, before returning to the gorgeous melody. This track alone is almost an entire EP. Highly impressive. Monster – Crazed riffing intro’s, making its mark. Again, those Cooper-esque vocals enter. Boulder-like drumming rolls through the track, playing around with feverish riffage. Very striking track, with lightning sharp effects. To Live – Coming in on another awesomely Testament-esque riff and drum roll. Expertly handled. Blitzing their way through, with absolute accomplished precision. Just a really melodic track, with high-energy vibes, in which the riffs really come into their own. Even a steel string section in there, combining with equally deep vocals, turning the mood, from light to dark, in an instant. Pepping it back up again, returning to the electric, screaming out the melody and even throwing out a few Vai-esque riffs in there, too. Mighty and heroic. Bringing back a bit of growl again, but the riff melodies are definitely at the helm here. Drumming pace is enthralling. Lyrics echoing the musical/opera strand again. Ending on an epic riff fest. This is talent beyond the average. Legion – Drum fest opens, onto a darkened landscape of machine-gun fire imagery and speed. Gory growls do their thing, alongside melodic vocals. Once more, it’s as if Testament have entered and this time, they’re improvising with Slayer. The pace and terror just doesn’t let up and the energy invested is tremendous. It just gets faster and faster, till you’re dizzy. This one is also well titled, since most metal tracks entitled ‘Legion’ tend to be fairly momentous events. Burning down the world, they give it everything they’ve got, to the bitter end. Sensational. Overall – ‘RFC’ is a monumental album of epic proportions. Takes a couple of tracks to really get into its stride, but once it does, there’s no stopping it. You’re just showered in fire, at breakneck speed, till the end. Beyond impressive, the growly bits might not get me, but the rest certainly does and it’s an incredible length of time, to maintain that momentum. A definite recommendation, ‘RFC’ portrays its title, to perfection. For fans of Testament, Slayer, Alice Cooper, Carcass, Zeit, Taint, Exodus. Venice May, from Paris, have just released their debut album, ‘Illusion Is Inevitable’. Dark alt rock, with influences such as, The Smashing Pumpkins, A Perfect Circle, Tool, Sigur Ros and Radiohead, their music is digitally available, on both the band website and on YouTube. VM are Natalia Samofalova and Vincent Bedfert. A Mouse And A Snake – Unusually plucky intro, with a breathy feel about it and quite beautiful feminine vocals. Like a lighter Sinead O’Connor. Slightly solemn, contemplative tone, easily performed, in a mid-paced rhythm, through a wistful, mysterious flow. Only I Will Remain – A slightly lower tone intro’s, with a brief oration, before those thoughtful, ethereal vocals take over again. It’s quite symphonic, reminiscent of Within Temptation and Nightwish. Similar themes aswell. Very much mood music, with meditative qualities. Hiding Place – Such a smooth intro, you can find yourself sinking into and getting lost in it. Some pointier notes in here, there’s a real fragility conveyed within it. Verging on Kate Bush style vocals, in places, as the emotion rises. Sliding, intuitively, into a gorgeous fade-out, the haunting atmospherics leave a real impression. Thinning Ice – Opening on another plucky intro, those vocals come in so easily, demonstrating true accomplished, intuitive skill. Piercing your emotions, with consummate ability, there’s real beauty in this. Its mystery and flow just pulls you in. More riff involvement approximately 3/4 in, some piano work in there too, providing just the right level of impact. Fading out gradually, but sharply. Mr & Misadventure – Very suitable intro for the title, injecting instant intrigue, in much the same vein as Andy Martin’s ‘Gent’, bordering on a more metallic ‘Abracadabra’ style. Gentle, yet affecting. Leaning into a darker strand, at one point, the vocals really are stretching themselves well, to their full potential. Echoing into the distance, it’s a perfect fade-out. Limerence – Now, it hits a very Cranberries-esque area, with that definite edge to its sound. A real catchy vocal tone in there. You could get swept away by this, for sure. Heating up the energy, as the emotion grows, taking the whole thing up, to the skies. Ending on a jagged riff, defining the intensity of the emotion further. Disequilibrium – A more gradual, introspective fade-in this time, the piano makes a stronger appearance, with some fluid, wave-like sounds surrounding it. Once more, those vocals soar, taking flight in the most vibrant way. Showcasing some real edgy vibes, through the range of tones and such power within them. Instrumentally, it’s almost like a simulation of whale sounds, around you, in an ocean. Amazing. Down That Alley – A more nostalgic thread creeps into this intro, from the start. Like a dream of days gone by, it’s swimming in powerful atmospherics. Lots more melodic riffing in here and generally, a looser feel to the whole track. Reflecting release, it’s a real exercise in letting go. One Way Out – Tighter riffs intro again, plucking their way into this next story. This time, the vocals combine the sounds of the late Dolores O’ Riordan, Sinead O’Connor and Sharon Den Adel, quite spectacularly. It’s quite a dreamy song altogether. Devils Lap – This is real Sinead O’Connor-esque stuff. Like a waking dream, it recounts the divisions and dichotomy within religion, for some, whilst symbolising an apparent desire to shroud the whole thing in purity, till you can envision a cloak of whitest white, covering every word. A real whirlwind of emotions is represented through these vocals, with such strength. The Nerve – Exciting racing riffage intro’s. Slightly lower toned vocals follow. Again, that depth of emotion enters, taking you with it. As the pitch heightens, it ends, quicker than the rest, but no less powerfully. XYZ – A definite catchy flavour to this one. Always profound and contemplative, it just flows, in one constant, perfected rhythm, in complete rightness and synchronicity. In The Presence Of A Ghost – There’s something very complete, whole and consolidating about this. Following a lovely rhythm throughout, each section connects beautifully. Portrayed in such a way that enables you to see an individual, surrounded by a cacophony of sound and thought all around and within them. The quietening of the sound and mood variations are also well represented, in a near perfect cycle of stages. Fading out on a buzz of remaining sounds, it’s hugely and yet, so sensitively emotive. Overall – Similar to a magical procession of sounds and shades of colour, tapping directly into your emotions, ‘III’ is a spectacular portrayal of all it aims to say. Almost mirroring its own delicate variety of emotions, as if through a reflective surface, the title suits it well and it’s both visual and auditory, with an almost tactile edge thrown in. ‘III’ is a piece of magic, encased within 13 tracks of mystery and intrigue. At once, dreamy and real. Even its artwork reflects its sound and feel. A highly imaginative album, softly, yet powerfully constructed. For fans of Within Temptation, Nightwish, Lacuna Coil, Delain, Sinead O’Connor, Kate Bush, The Cranberries. https://www.youtube.com/watch?v=N1whOT5TaF8 (debut video for ‘Hiding Place’). All songs by Vincent and Natalia. Mixed and Mastered by Alexey Stetsyuk, @ Grave Town Productions. Bass recorded by Rafael Leroy. Drums, by Simon Lemonnier. Photography and Artwork by Eleanne Grey 2018. 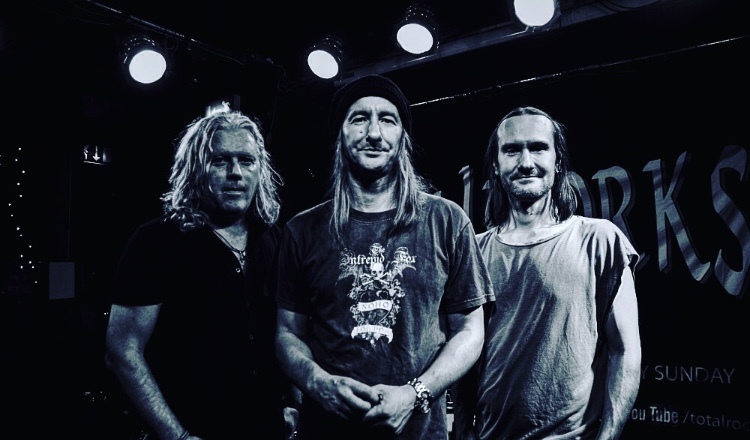 Self released on 1st March 2019, the new album, ‘Cargo Cult’, from Outright Resistance, has already met with acclaim from Metal Hammer and Terrorizer magazines. 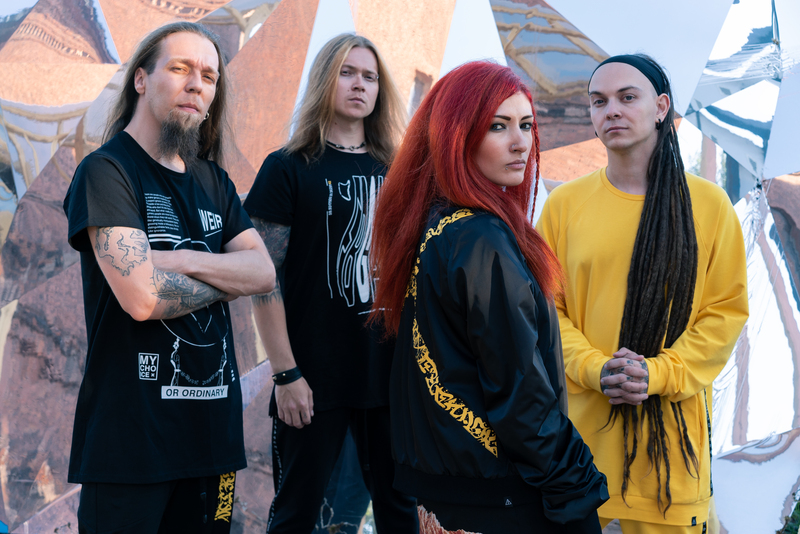 Having played live at Bloodstock Open Air, on tour with Arch Enemy, OR are carving out a name for themselves early on in the scene. ‘CC’ was produced, mixed and mastered by Justin Hill, of Sikth. Based in Stevenage, UK, OR play metalcore and have recently taken on a new lead vocalist, James Jest and launched a music video for the lead song, ‘Fang And Bone’. This track ponders the seemingly negative influence of social media, in today’s climate. The recording of the album itself was split between Whitehouse Studios, Reading and Unit 2 Studio, Wembley. OR’s sound has evolved significantly, thanks to their openness to experimentation and change. ‘CC’ looks not only at the issues of the digital world, but also, more personal topics, eg, the social experience of mental health issues and war. Within ‘CC’, the band wanted to examine the evolution of the music industry, as a whole and that of current media platforms, as opposed to previous formats. Considering, in addition, the struggles of getting ahead, as a musician, in today’s world. From OR’s songwriting style came a determination to create heavy, catchy songs, with plenty of moshing potential. In short, ‘moshability’. A 5 piece, formed in 2011, they’ve taken inspiration from the founding fathers of classic metal. So far, there’ve been two EP’s, several tours, including a slot at B.O.A. and headlining Friday night at Beermageddon 2017. Lately, touring Russia, playing main support to Arch Enemy, along with 2 headline UK tours. ‘CC’ is their debut album. ‘Fang And Bone’ is the 1st single from ‘CC’, delivered with the aggression reflecting the rest of the album. Looking forward to a new chapter in their careers, ‘CC’ is principally about exactly that – looking forward, rather than back. Gently – That’s one startling intro! Incredible power in the level of that volume. Deathy vocals, very growly, but some audible lyrics are present. It paints a very black lyrical picture, with plenty of creepy imagery. It’s quite a sinister tone and tends to evoke images of a gothic, freak show circus of old. Almost bordering on traumatic. Not for the easily shocked. Scripture – Relief, as a lighter riff melody opens, but though it’s an easy listen, it’s still unarguably heavy. Just more melodically so. Very riff-based, with plenty of drum input. Same blackened vocals, but just taken down slightly, to a marginally less aggressive volume. Ending on a vacuum of air, as if being sucked back into itself, it makes its point. Fang And Bone – Introing on a gradual fade in, this one’s a monster, in vocal terms. There’s intermittent melody, but those roars are relentless. Power packed drumming closes it, leaving an echo, like the acoustics of a lone, bouncing baseball, in an empty gym room. The Wretched One – Another gradual fade in, but more of a catchy, action basis to this. Decent rhythm, but incorporating some slight melody into the vocals, breaking it up a bit. Now the riffage hots up a little, adding a bit more colour. Fast-paced drum rolls, well timed, add just the right backbone. It’s becoming clear that OR are strong fans of the vacuum intro/outro sound, which is how this closes aswell. Lone Wolf – Coming in on a drum fest, at a frenetic pace, apoplectic vocals follow. More melodic quality to the riffs again. Vocally, it’s almost like an aural representation of Teen Wolf, as you imagine the werewolf breaking out of his human skin. It’s just a continuation of rage. All the way through. Cargo Cult – Another fit of aggression, with all the violent drumming to show for it. A complete sensory assault. Yep it’s getting a bit repetitive now. Parthenocarpy – Slightly more promising. Something of a film soundtrack sense to this, along with a hint of Linkin Park-esque atmosphere. There’s an audible edge of punk/protest mood here. Liking the more rhythmic, melodic slant to this. Something slightly Pantera-esque about it too. At least it does seem to reflect some kind of point. The lyrical focus serves this track better. Anger Dulls The Blade – Heavy loaded intro, setting the scene straight away. A clear fighting theme characterises this, but that’s unsurprising, given its title. A power punching drum roll accompanies the constant outpouring of vocal venom. Just seeing red throughout. Holocene Epoch – Again, that familiar vacuum intro, this time, rapidly overtaken by a Van Halen-esque riff fest. Active drumming and Ghost/Slipknot-esque vocals intermingle with now very slightly looser fretwork. Impressive rate of rhythm. Ending on a faster fade-out. Error Incarnate – Opening on an obscure graveyard image evoking dark breeze. One last hurrah of vocal rage and now, a brief Ghost-esque keyboard section enters the fray. Increasing lyrical clarity, in places, interlaced with monster growls and roars. Fading out for the final time, on a keyboard outro, adding extra atmosphere. Overall – A lesson in aggression is probably the best summary of ‘CC’. It’s really just an album of pure rage and little else. Though tricky to counterbalance that with anything else, there are some tracks with more musical quality and melody and at times, the lyrics are briefly audible. No real issues, production-wise. Just a bit too angry and growly for me. For fans of Ghost, Slipknot, Amon Amarth.